As an experienced student of English, you know the language can be a tricky one to learn thanks to its complex verb forms, like irregular verbs. 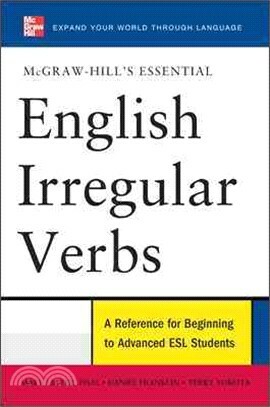 Written by ESL guru Mark Lester--author of Grammar and Usage in the Classroom--this authoritative reference unravels the mystery of this verb form so you can take your English-language skills to the next level. For each entry, you'll get example sentences and conjugations, a complete listing of complements, the most important phrasal verb constructions, and common expressions--all in an easy-to-understand format. In no time you'll master irregular verbs and converse like a native English speaker! Mark Lester is an experienced grammarian, ESL expert, and professor emeritus of Eastern Washington University. He was the founding chairperson of the ESL department at the University of Hawaii, considered one of the best ESL programs in the United States. He is the author of more than a dozen books, including Grammar and Usage in the Classroom, one of the most widely used college grammar textbooks in the country. For McGraw-Hill Professional, he authored McGraw-Hill's Essential ESL Grammar and with Larry Beason he coauthored The McGraw-Hill Handbook of English Grammar and Usage. Dr. Lester obtained his BA in philosophy and English literature at Pomona College and his PhD in Linguistics from University of California-Berkeley. He also holds an MBA from the University of Hawaii. Daniel Franklin and Terry Yokota are the producers of McGraw-Hill's Big Book of Verbs series and are experts at creating effective language acquisition texts--editing and authoring references, grammars, and textbooks for learners of Chinese, English, French, Italian, Latin, German, Polish, Russian, and Spanish. Franklin obtained a BA in Latin at Eastern Illinois University and did graduate work in linguistics at Harvard University. Yokota obtained a BA and MA in Spanish language and literature at Washington University in St. Louis. Master more than 200 irregular verbs and communicate in American English with confidenceAs an experienced student of English, you know the language can be a tricky one to learn thanks to its complex verb forms, like irregular verbs. Written by ESL guru Mark Lester--author ofGrammar and Usage in the Classroom--this authoritative reference unravels the mystery of this verb form so you can take your English-language skills to the next level.For each entry, you'll get example sentences and conjugations, all in an easy-to-understand format. In no time you'll master irregular verbs and converse like a native English speaker!